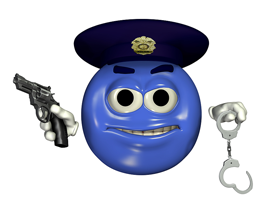 Home Business Why Have Article Directories Escaped Google’s Link Sale Penalties? 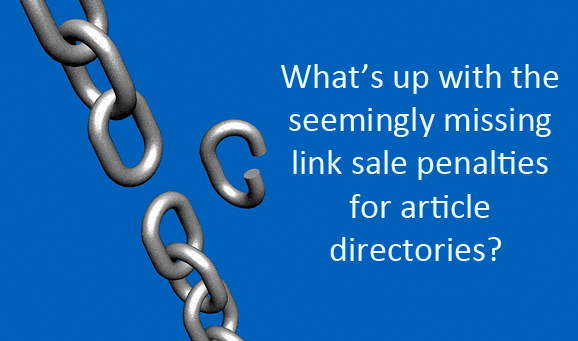 Why Have Article Directories Escaped Google’s Link Sale Penalties? Today I want to talk about two of my least favorite topics: article directories and Google (or more specifically Google’s inflated sense of self in thinking they should be able to use their sometimes seemingly monopolistic weight to tell others how they should run their sites). I know many of us don’t care about Page Rank anymore, and I’d consider that for the better. But quite a while back an authority blog I run was penalized, from a PR6 down to a 0. That was because of paid text link advertising on the site. Every link was well-vetted to make sure I didn’t advertise anything irrelevant to my audience or that I couldn’t wholeheartedly recommend to my blog readers. Nothing scammy about it. I just don’t think it’s appropriate to change your code in any way to assist search engines in overcoming their faulty algorithms. After all, that would be a case of intentionally doing something for search engines rather than your visitors by showing them two somewhat different things — something Google frowns upon when it doesn’t serve their self-interest. I’ve never been one to let a third party tell me how to run my business though, and to this day I won’t allow Google to tell me what kind of advertising I can accept and how it should be displayed (especially when private ads are often far higher quality than the ones they put out via Adsense). And the site continues to thrive. I know some of you are probably wondering why I’m talking about paid links and article directories at the same time. After all, article directories are free, right? Sort of. The simple truth is this. Content producers buy links on article directories, and they pay for it via bartering. They provide content in exchange for those links just like others provide cash to sites for ads. That content is then used by the article directory owner to make money via ads (ironically often through Adsense). And it’s fairly well-known that a primary reason for using article directories is specifically to get that “link juice.” Any way you cut it there’s payment for links going on (and in this case Google’s even indirectly involved in those payments). There is absolutely no reason that I can see that justifies holding these sites to a different standard. By all means I know Page Rank doesn’t mean much these days. But it’s the principle of it really. After all, Google is making a public claim of your site’s worth or value to visitors when they issue a Page Rank. And to say a site has no value in that sense because they disagree with an advertising model is disingenuous at best. Maybe I should be calling for the abolishment of Page Rank altogether. But that would hardly be new, and for some reason Google seems to be holding on to the old dinosaur. And I think as long as it’s made available to Web browsers finding my sites, I’ll be at least slightly annoyed by the false representation Google gives of a site’s relative “importance” if they don’t bow to their advertising rules. This is mostly because at the same time they still seem to highly value article directories that are largely filled with poor quality content and dozens of articles essentially saying the same thing, all while offering do-follow links in return for payment via contributed content. So again, I have to ask you “why is it that article directories seem to be exempt from the Page Rank penalties, or at least not hit as hard as private site owners providing true authority content?” It might not bother you at all, and that’s completely fine. It was just something I checked into recently and I was surprised to find how passionate I still was about the issue, so I wanted to open it up to your thoughts. Do you let Google’s rules dictate how you run your site? Are you thriving even without bending to Google’s every whim like I’ve managed to do over the years? How are you doing it? Do you think article directories should be more greatly penalized, or do you think they really should be an exception? Why? Share your thoughts in the comments below. Learning by Doing: Is This the Best Way for Your Child to Learn?